To evaluate the comparative efficacy and safety of ropinirole and pramipexole as adjunctive therapies to levodopa (l-dopa) for the management of advanced Parkinson’s disease (PD), via a systematic review and network meta-analysis. 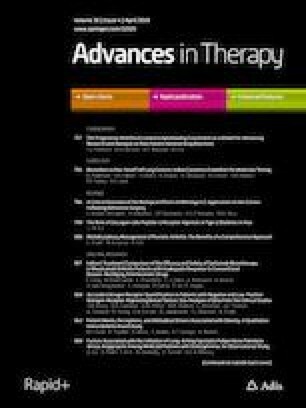 Twenty-one double-blind randomised controlled trials of patients with advanced PD with motor fluctuations receiving l-dopa comparing ropinirole or pramipexole with comparators were identified from 2550 publications. Bayesian indirect comparison methods were applied to independently review efficacy outcomes including off-time reduction, Unified Parkinson's Disease Rating Scale-Activity of Daily Living (UPDRS-ADL) and UPDRS-motor scores, and safety outcomes including adverse events (AE) and patient withdrawals, to determine indirect treatment comparison mean differences (MD) or hazard ratios (HR) with 95% confidence intervals (CI). The indirect efficacy comparison resulted in a statistically nonsignificant off-time reduction difference (hours) of ropinirole-sustained release (SR) versus pramipexole-immediate release (MD − 0.25; 95% CI − 0.71, 0.21) and ropinirole-SR versus pramipexole-extended release (ER) (MD 0.18; 95% CI − 0.40, 0.76). Ropinirole-SR adjunctive treatment showed a tendency towards more improvement in UPDRS-ADL score (MD 1.24; 95% CI 0.23, 2.24) than adjunctive treatment of pramipexole-ER. Pramipexole-ER may be less likely to induce somnolence as an AE compared with ropinirole-SR (HR 0.46; 95% CI 0.23, 0.89). However, there were no statistically significant differences in UPDRS-motor score reduction, incidence of dyskinesia, hallucination, hypotension, insomnia and nausea, or withdrawals due to AE, for any reason. Adjunctive therapy with ropinirole-SR or pramipexole appears to offer similar efficacy and tolerability in patients with advanced PD on the basis of this indirect comparison. To view enhanced digital features for this article go to https://doi.org/10.6084/m9.figshare.7857452. The online version of this article ( https://doi.org/10.1007/s12325-019-00938-1) contains supplementary material, which is available to authorized users. Funding for this study (internal study number 206707/HO-16-17237) and the journal’s article processing charges was provided by GSK. Editorial support in the form of formatting text, tables and figures and grammatical editing was provided by Jennie McLean, PhD, Fishawack Indicia Ltd, UK, and funded by GSK. Anonymised individual participant data and study documents can be requested for further research from www.clinicalstudydatarequest.com. Hattori N, Nishioka H, Hasegawa K. Comparison of ropinirole controlled- and immediate-release in Japanese patients with advanced Parkinson's disease. Neurol Clin Neurosci. 2015;3(1):18–24. https://doi.org/10.1111/ncn3.128.